We sell a lot of replacement Motor Caps with Brushes for Bosch Type Motors on Meyer E-47 Plow Pumps. 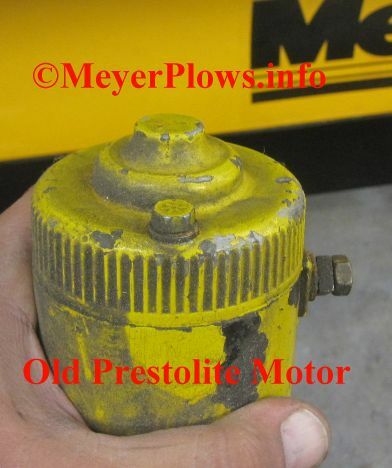 Lately we have had a lot of customers buying them at SmithBrothersPlowParts.com only to find out they have an old Prestolite Motor on their Meyer E-47 plow pump. The Bosch Type Motor Cap will not fit Prestolite Motors. The Prestolite Motor was used on early Meyer E-47 plow pumps, as well as the U-13 Meyer Plow Pump. Here is a picture of the top cap of a Prestolite Motor. Brush kits are still available for these motors. To install them, you must be able to solder. The cost of the brush kits is around $40. It is not really worth it to replace them when it is about half the cost of a new motor. Plus, the rest of the motor is still around 30 years old! A Bosch Type Motor will bolt right on in place of the Prestolite. You might have to drill and tap the holes for the Bosch, but there are two areas for this already on the top of the pump. It is not difficult. You can buy a replacement Motor Cap with Brushes for a Bosch Type Motor Here.